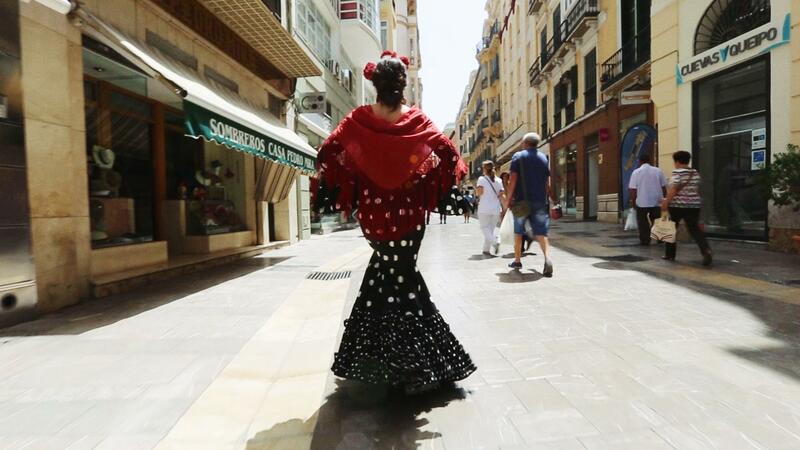 Few traditional clothes are as easily recognised as the Andalusian flamenco dress. 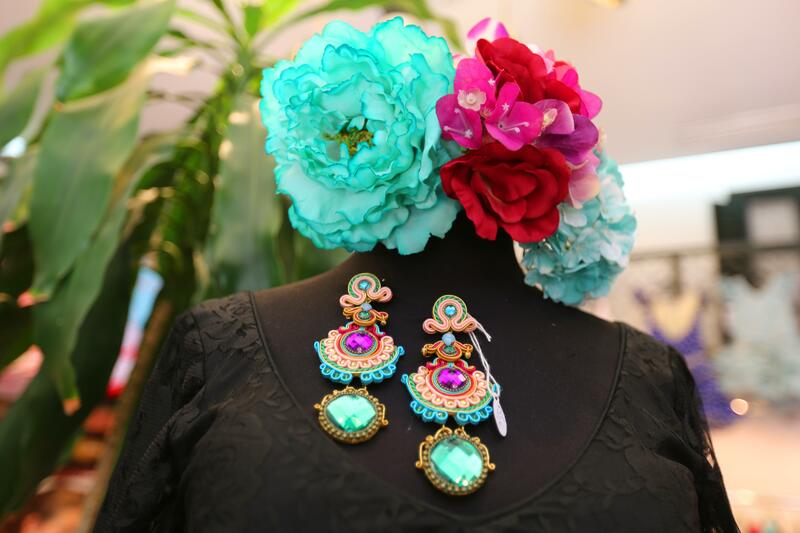 It is the true ambassador of Andalusian culture the world over and this characteristic feature of traditional Spanish festivals has earned a growing number of admirers over the years, carving out a prominent place, even in the competitive world of high fashion. If you are planning a holiday in Andalusia this summer you may already know that the famous Malaga Feria takes place each year in mid-August and this week-long street party is considered by many Spaniards as the biggest festival of the year. If you want to stroll through the historic centre of the city in true Andalusian style, read on to discover everything you need to know. The flamboyant flamenco dress, known in Spain as a "traje de flamenco” (flamenco dress), "traje de Sevillana” (Sevillian dress), "traje de gitana” (gypsy dress) or more rarely "traje de guitarra” (guitar dress), seems to have its origins in Seville. 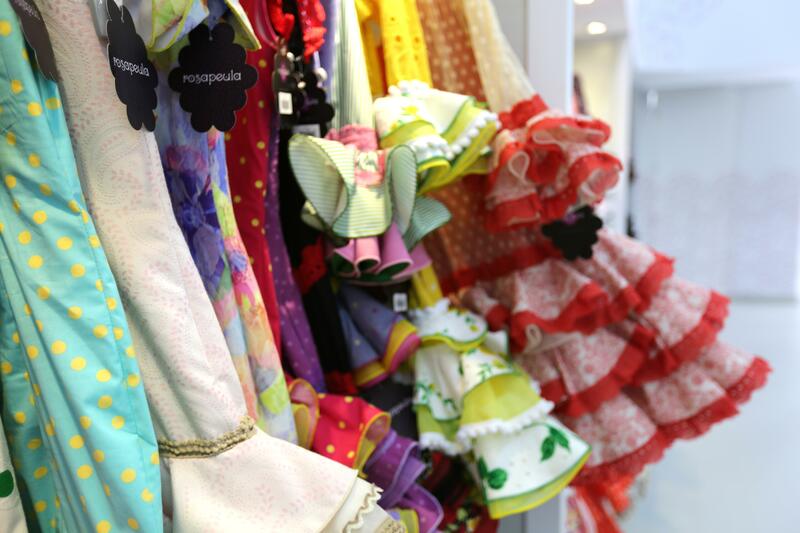 Towards the middle of the nineteenth century, various agricultural fairs took place around the city of Seville and many gypsy farmers wives began attending these fairs wearing handmade dresses which they had crafted from old, everyday clothes. They were often adorned with ruffles and frills in order to make the simple fabrics more beautiful and aesthetically pleasing. During the Seville Ibero-American Exposition of 1929, members and representatives of high society attended the event wearing the traje de Sevillana (pronounced tra-hey), and thus, the dress received its first official recognition. From that time, the popularity of the dress began to spread outside the borders of the region, eventually becoming a truly distinctive element of Andalusian culture. 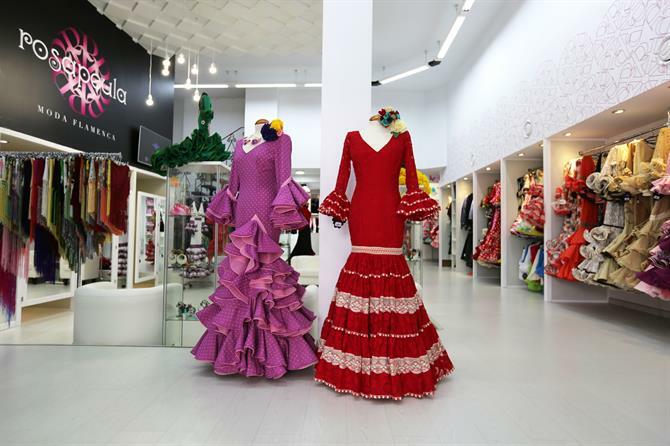 Maintaining its most recognisable features (fitting, cut, and accessories), the dress has accompanied the evolution of the regional flamenco tradition and has spread even further, both nationally and internationally. 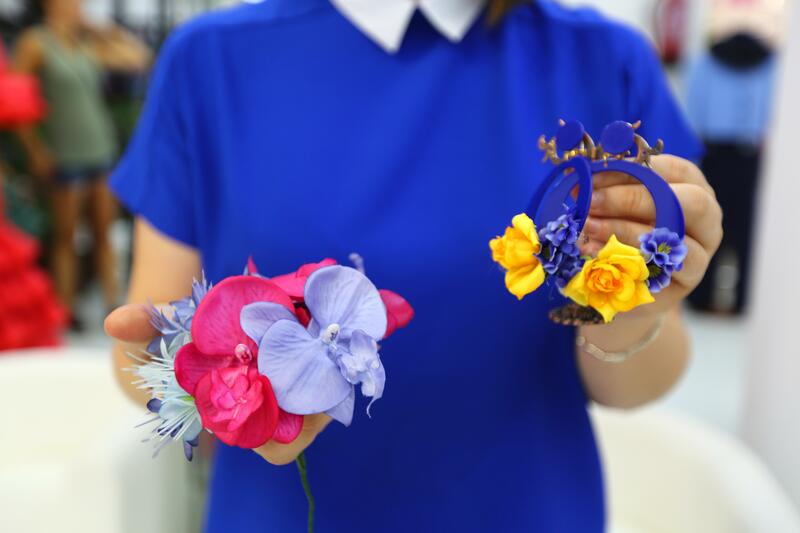 Over the years, the dress has naturally been affected by the progression of different trends in style and detail, often breaking with tradition and following the changes in fashion over the years. Thus, since the miniskirt popularity of the 1960s, knee-length flamenco dresses soon became popular and have remained so until now. These days, you can choose from various cuts and prints, short or long lengths, with sleeves or without, block colours or with the traditional polka dot design - the oldest and most popular. Women can also choose to wear a masculine-cut suit (with a short jacket, trousers, belt and hat), which is the best choice if you decide to attend the Feria on horseback. 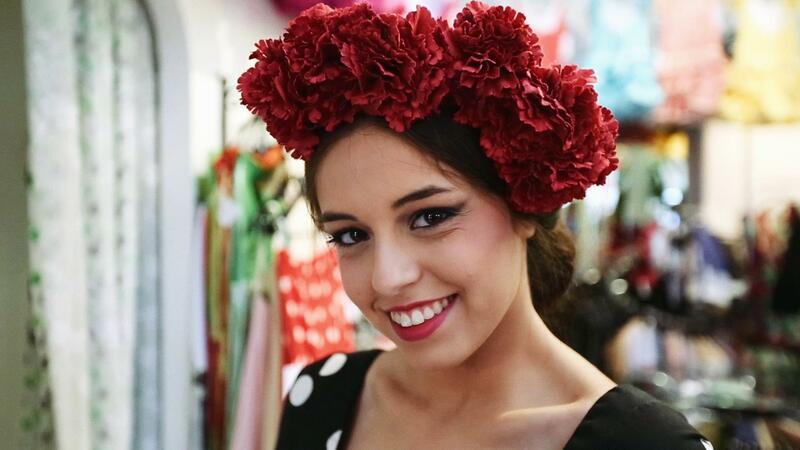 The flamenco dress is mainly worn during the various Andalusian holidays such as the Ferias of Malaga and Seville, the “Romerias" which are pilgrimages or religious celebrations, or on special occasions such as beauty contests or fashion shows - it’s not usually worn as an everyday dress. It is of course also used during flamenco shows, but the dancers have a specially adapted version of the dress with a train (bata) which emphasises the movements of the "bailaora" or dancer. 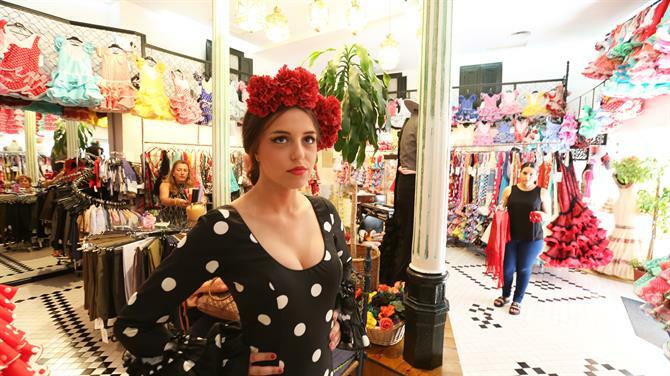 Despite the popularity of the flamenco dress giving rise to a thriving manufacturing industry, a substantial number of customers still prefer to make their dresses by hand. It takes about three to four days to make a dress from hand and it can be quite a lot cheaper too. The price of a new dress can vary quite considerably; from €100 to €1000 depending on the material, design and quality. Prices can even go beyond €1000 for very high quality tailoring. On top of the cost of the dress, the necessary accessories must also be bought and these include: the “mantón de manila” (a fringed shawl which takes its name from the Port of Manila, made of satin or silk and embroidered with flowers and birds), the peineta (a decorative comb worn in the hair, styled in the classical bun), shoes (strictly with heel), earrings (circular style is the most popular), brooches, bracelets and necklaces. 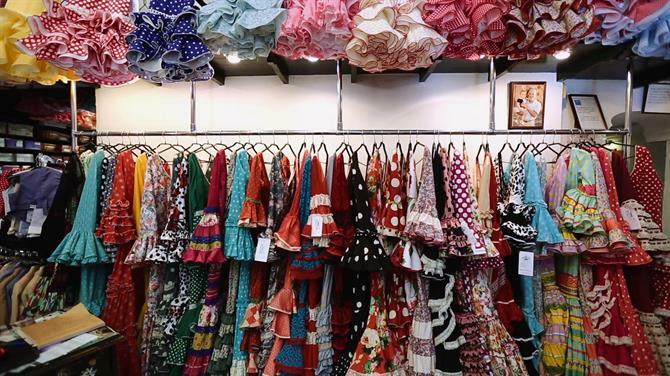 It’s possible to rent a flamenco dress, but there’s also a thriving market for second-hand clothes; if you want to attend the Feria in traditional Andalusian style you will find a number of options to suit all budgets in the specialist Feria shops. Special thanks to specialist Feria outfitters Viva La Feria and Rosapeula (Malaga, Spain) for their collaboration on this article.